We offer a variety of Sacred Ceremonies that celebrate life's journey such as Weddings, Memorials, or special rituals and ceremonies. As you enter the journey of relationship, do so consciously, lovingly, equally, and beautifully. Sacred You! 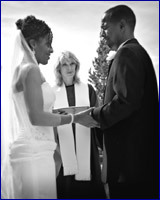 Ministry offers both celebratory, non-denominational ceremonies, and ongoing couples support for the journey ahead. Your wedding is a sacred joining of two souls in a partnership of peace, contentment and love. Sacred You! ministry offers a ceremony that embodies the spiritual essence of all faiths and provides a loving foundation for your life together. Our ceremony includes traditional wedding rituals such as exchanging of the vows and rings, and a candle ceremony. It is also unique in many ways. We encourage your involvement in personalizing the ceremony by adding your own vows, verses, poems and readings. This day is about celebrating the sacred in both of you in this divine union. We will support you in creating a meaningful and joyous ceremony. Loving consciously and living skillfully brings the committed relationship to ever new levels of joy and intimacy. Sacred You! ministry offers private counseling where you and your partner learn and practice communication and relationship skills. This program encourages deeper understanding of one another. You and your partner will explore and strengthen your commitment, values, and ability to handle life's challenges. Together you will develop spiritual principles that provide a foundation for a strong and rewarding relationship. Both as preparation for your new life together as a couple, and to enrich your marriage through the years, our program offers opportunities to strengthen and deepen your relationship and the joy of loving one another.